On Saturday afternoon, I’ll Have Another will try to follow up his Kentucky Derby win by out-dueling Bodemeister (the odds-on favorite) and the rest of the field in the Preakness Stakes. If he can do it, he’ll be the 12th horse in three decades to win the first two legs of the Triple Crown. Of the first 11, none have gone on to win the Belmont. The dry spell now stands at 33 years, dating back to 1978, when Affirmed won all three legs in dramatic fashion. Affirmed came from a strong ancestral line that included 1937 Triple Crown winner War Admiral, and as a two-year-old in 1977, he won seven of nine starts. In six of those races, he faced Alydar, a chestnut stallion from Kentucky’s Calumet Farm. Affirmed won four meetings, Alydar won two. That set up the 1978 Triple Crown, and what would become the greatest rivalry in horse racing history. It began at the Kentucky Derby, where Alydar was a 6-5 favorite after impressive workouts in the lead-up to the race. Affirmed’s jockey, Steve Cauthen (who had just turned 18 the week before) established a lead on the far turn, and it was enough to hold off Alydar’s late charge. The win — by 1.5 lengths — would be the least dramatic of the three races. The horses met again in the Preakness two weeks later. This time, it was Alydar making a move on the far turn after Affirmed held the lead for most of the race. The two horses separated from the pack, and Alydar chased down his rival on the home stretch. That led to the third leg at the Belmont Stakes. Some thought the longer race would benefit Alydar — his late charge would have extra time to materialize, and the near misses would become a surging win. As in the Preakness, the two horses separated from the pack. Together, they ran what is still the fastest closing mile in Belmont history. Since that breathtaking duel, no horse has won the Triple Crown. But while Affirmed went on to lead a quiet post-racing life before his death in 2001, the story of Alydar was about to get very, very strange. Back on Calumet Farms, under the ownership of J.T. Lundy, Alydar became one of the most successful sires ever. His fee was $250,000 — an unprecedented amount for a stud horse. His offspring included several champion racers, including Alysheba, who won the Derby and Preakness in 1987. Then, in November 1990, he shattered his leg in his stable after apparently kicking (and busting) a roller that kept his stall door on track. Emergency surgery was unsuccessful, and Alydar was euthanized. J.T. Lundy, who took over as owner of Calumet Farms in 1982, ran up huge amounts of debt renovating the farm, buying thoroughbreds, and purchasing new property. Alydar was his main source of income, and he instituted a new policy of “lifetime breeding rights” that cost $2.5 million. Frank Cihak, then a vice chairman of Houston’s First City bank, helped Lundy secure a $50 million loan in 1988. Weeks later, unable to make payments, Lundy asked for more, which Cihak signed off on. It was later discovered that Cihak was paid more than $1.1 million through a shadow organization run by Lundy, part of which Cihak used to lease Calumet mares that were then bred with Alydar. It appeared that for these favors, Cihak protected Lundy at First City. In 1990, after running up millions in bad loans, Cihak was forced to resign. He later faced charges and — in 1993 — was sentenced to 12 years in prison for illegal kickbacks. He was given a 22-year sentence in 1995 for similar schemes. Shortly after Cihak’s resignation, First City restructured the loans to Lundy and Calumet Farm, demanding a $15 million payment by 1991. In late 1990, insurance giant Lloyd’s of London lost patience with Lundy’s late payments, and threatened to cancel. Another insurance company out of California said it would not renew the policy on Alydar when it expired in December of that year. 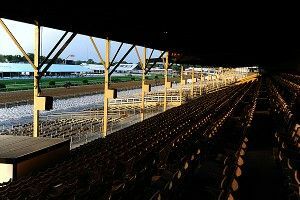 With the hefty insurance policy on Alydar about to expire, and a $15 million payment hanging over Calumet’s head, the farm’s night watchman was told to take a night off. The evening of his absence, Alydar suffered the broken leg. Lundy had Lloyd of London’s insurance money within a month. An engineer testified that the force need to break the roller was at least three times what any horse could deliver with a single kick. The top halves of the two bolts that were supposedly broken in half from the roller were retrieved, along with the bottom halves still in the concrete floor. They didn’t match. It was also evident that the force required to break them had come from outside the stall, rather than inside. The engineer speculated Alydar had been killed when someone tied a rope to his hind leg and the other end to a truck before driving away. In the end, Lundy lost the farm eight months after Alydar’s death; his debt was too heavy to overcome, even with the insurance money. He was sentenced to four years in prison in 2000 for bribing Cihak, but the judge declined to pursue the Alydar charges. Lundy maintains that he wasn’t responsible for the death, and his sentence and probation are already over. In 2010, his son Robert was charged with four felonies for fraud pertaining to horse breeding. It was a horrible end for the greatest runner-up of all time. So, the day before the second leg, let’s focus on another passage in Hollandsworth’s article. It’s a small vignette, but it conjures the great rivalry whose memory is rekindled each time a Triple Crown bid comes up short. Ironically, (Alydar’s) old rival, Affirmed, was also at Calumet in 1990, leased by the farm to be one of its stallions. When the two chestnut-colored horses were out in their paddocks, they would stare at each another, their manes flicking in the breeze. Occasionally, Affirmed would start running on his side of the fence, and Alydar would take off after him on the other side. Even then, twelve years after their races, they remained competitors.